Ryan Gile, the Las Vegas Trademark Attorney, reports on an interesting and complicated new lawsuit revolving around the ownership of the mark TROPICANA – for casinos and hotels, not orange juice. 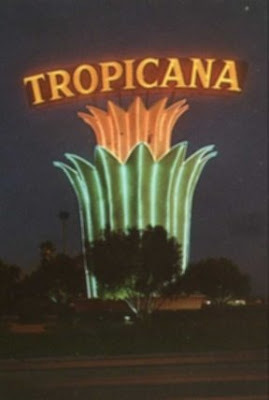 “The Tropicana’s famous roadside sign, a Las Vegas landmark dominating the Strip and welcoming arriving guests for a half-century.” (from the complaint). The complaint tells the story of the famous Tropicana hotel in Las Vegas, which opened in 1957. In 1979, Ramada became the owner of the hotel and named the operating company Hotel Ramada of Nevada, Inc. In 1989, the Ramada chain sold the stock of the Hotel Ramada of Nevada to Aztar Corporation. Part of the acquisition included the assignment of a pending trademark application for TROPICANA filed by Ramada, Inc. In 2006, Aztar Corporation’s stock was purchased by an entity now known as Tropicana Entertainment LLC, a defendant in the suit. According to the USPTO assignment database, the mark was thereafter assigned to Tropicana Entertainment LLC on September 12, 2007. On May 4, 2008, Tropicana Entertainment LLC (the parent of Aztar Corporation) and most of its subsidiaries filed for bankruptcy in Delaware under Chapter 11. As part of the reorganization, the lenders converted their claim in bankruptcy to equity ownership of the new entities formed to operate the Tropicana Las Vegas, the plaintiffs in the lawsuit. The trademark, though, would still be owned by Tropicana Entertainment LLC. Part of the original bankruptcy plan was for the Las Vegas hotel company to pay $10 million over five years to Tropicana Entertainment LLC for a license to the trademark. The former lenders objected to this provision, so, according to this motion filed in bankruptcy court, the plan was confirmed but with a reservation of the right to dispute the trademark issues until post-bankruptcy. Tropicana Entertainment then filed trademark applications for THE TROP LAS VEGAS EST. 1957, which could only mean the Tropicana Las Vegas. The new Las Vegas hotel owners took this as an opportunity to file a declaratory judgment action, asking the court to declare that the Las Vegas hotel be allowed to continue to use the name TROPICANA without a payment. Clark County honored itself and the Tropicana by naming one of its major boulevards – Tropicana Avenue – after the storied property whose name is the subject of this lawsuit. The Tropicana name thus is not only an integral part of the hotel/casino itself and an integral part of Las Vegas history and legend, it is a name stamped indelibly on Las Vegas’ very geography. the Tropicana has enjoyed the use of its own name, without any demand for royalty or any attempt at interference by any of the entities that purported to register the name Tropicana as their own without any consideration to Hotel Ramada of Nevada. But while the Tropicana Las Vegas was the first casino to use the name, it concedes there are now other hotels that have the right to use the Tropicana mark. It therefore does not appear that there was necessarily anything untoward when a Ramada entity filed the original trademark application, when the application was then transferred to the new owner Aztar, or when Aztar assigned the registration up to its new corporate parent. Perhaps what went wrong is that it does not appear there was any formal license for the Tropicana Las Vegas to use the mark. That’s all well and good when everything stays in the family, but it’s the nature of the corporate enterprise that parts get split off voluntarily or, as in this case, involuntarily. So while the complaint spins a story of a stolen trademark, what it looks more like is a question of when and how the terms of an implied license can be changed. But there’s plenty of other fodder; the plaintiff hasn’t conceded that the original registration or any of the subsequent assignments were valid. This will be really interesting to watch. P.S. TROPICANA is an example of how not to use and license a trademark. While the court documents state that there are several legitimate licensees of the Tropicana mark and I could find a number of hotels using the name “Tropicana,” there is no consistency in logos or appearance whatsoever. Some appeared to be entirely unrelated, making one wonder about the exclusivity of use of the Tropicana mark by the parties. I couldn’t even tell if this was the legitimate site of the parent entity.